Soren Aaby Kierkegaard lived eighteen hundred years after the Christian Era (CE) had been inaugurated through the life and teachings of Jesus Christ. Christ chose twelve single individuals to follow him. He demonstrated to them what it means to be like God, his Father. These twelve became seventy and then the seventy single individuals became more as the Good News of salvation through Christ spread throughout the area. Kierkegaard wondered if the message spread through group learning or from one single individual interacting with another. Christ seemed to use both methods in his ministry. The “assembly” of those single individuals into one group came to become known as the church. A book called the Bible came together over time and became the authorized text for information about this new idea called Christianity. Where did the Authority come from for one individual to talk to another about becoming a Christian? Kierkegaard asked this question in full in his 1846 book, Concluding Unscientific Postscript to Philosophical Fragments using the pseudonym Johannes Climacus. In the isolation of the imaginary construction, the whole book is about myself, simply and solely about myself. “I Johannes Climacus, now thirty years old, born in Copenhagen, a plain, ordinary human being like most people have heard it said that there is a highest good in store that is called an eternal happiness, and that Christianity conditions this upon a person’s relation to it. I now ask: How do I become a Christian? I ask solely for my own sake. I wanted to say that as soon as just one person could inform me where and to whom one applies for permission to write as a solitary person or to set oneself up as an author in the name of humanity, of the century, of our age, of the public, of the many, of the majority concerning the same matter, to dare, when he himself owns up to belonging to the minority, to write in the name of the many, and then as a solitary person simultaneously to have polemical elasticity by being in the minority and recognition in the eyes of the world by being in the majority-if anyone could inform me about what expenses are connected with the granting of such an application, since even if the costs are not paid in money they could very well still be exorbitant-then, on the presupposition that the costs will not exceed my means, I would very likely be unable to resist the temptation to write as soon as possible an exceedingly important book that speaks in the name of millions and millions and millions and billions. Who did the Apostle Paul go to to get permission to write his epistles? Who did Matthew go to before he wrote what he wrote? More importantly, who did Christ go to when he spoke the words he spoke? The Roman Empire under Constantine issued an edict stating that Christianity was to be tolerated in his realm and he planted one capital of his empire in Rome and another in Constantinople. The religion of Christ moved from single individual to single individual until the temporal authorities became anxious to organize and create systems of order based on past examples. 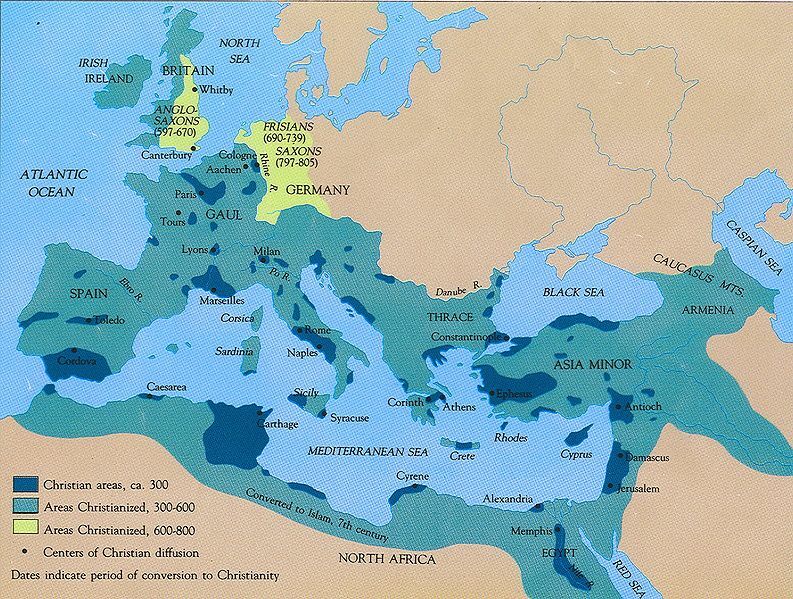 The map below shows where the religion of Christ spread throughout a large area between 481 and 814. Clovis, another ruler, issued a proclamation about making Christianity the religion of his people. Does that mean everyone instantly became a Christian? 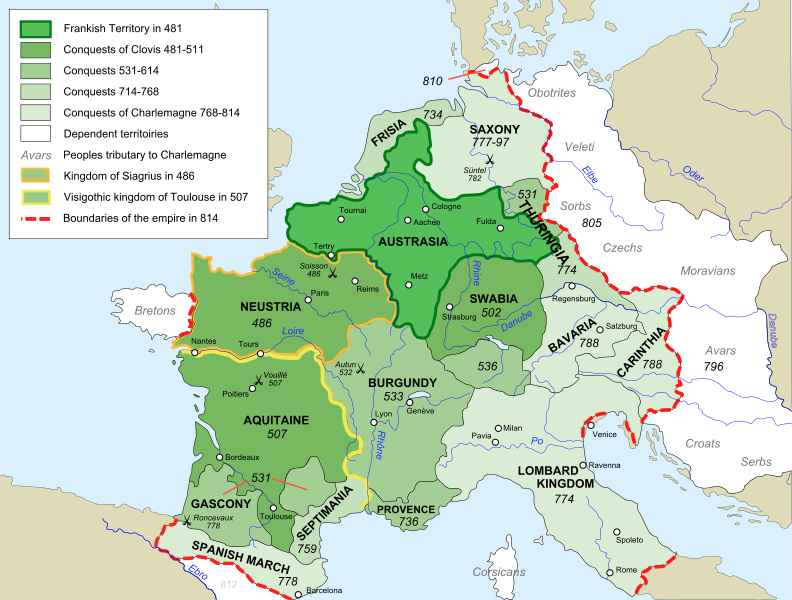 Charlemagne started what became known as The Holy Roman Empire around 800 AD. The Eastern Orthodox Church broke away from the Western Roman Catholic Church in 1054 and this act, which was somewhat like the Confederacy breaking away from the Union in the United States, was the cause of an enduring controversy over the Authority in the world of the spirit. The religion of Christ was fast becoming the Christ of religion. Having first invocated the Name of the Lord Jesus Christ our Savior, we will enterprize his Work; wherein we shall not only teach how to change any inferior Meter into better, as Iron into Copper, this into Silver, and that into God, etc. but also to help all infirmities, whose cure to the opinioned and presumptuous Physicians, doth seem impossible: But that which is great, to preserve, and keep mortal men to a long, sound, and perfect Age. This ART was by our Lord God the Supreme Creator, engraven as it were in a book in the body of metals, from the beginning of the Creation, that we might diligently learn from them. Therefore when any man desireth thoroughly and perfectly to learn this Are from its true foundation, it will be necessary that he learn the same from the Master thereof, to wit, from God, who hath created all things, and only knoweth what Nature and propriety he himself hath placed in every Creature. Wherefore he is able to teach every one certainly and perfectly, as he hath spoken, saying, of me ye shall learn all things: for there is nothing found in Heaven nor in Earth so secret, whose properties he perceiveth not, and most exactly knoweth and seeth, who hath created all things. We will therefore take him to be our Master, Operator, and Leader into this most true Art. We will therefore imitate him alone, and through him learn and attain to the knowledge of that Nature, which he himself with his own finger hath engraven and inscribed in the bodies of these Metals. Hereby it will come to pass, that the most high Lord God shall bless all the Creatures unto us, and shall sanctify all our Ways; so that in this Work we may be able to bring our Beginning to its desired End, and the Consequence thereof to produce exceeding great Joy and Love in our Hearts. But if any one shall follow his only Opinion, he will not only greatly deceive himself, but also all others who cleave and adhere thereunto; and shall bring them unto loss. For mankind is certainly born in ignorance, so that he can neither know nor understand any thing of himself; but only that which he receiveth from God, and understandeth from Nature. He which learneth nothing from these, is like the Heathen Masters and Philosophers, who follow the Subtleties and Crafts of their own Inventions and Opinions, such as are Aristotle, Hippocretes, Avicenna, Gallen etc. who grounded all their Arts upon their own Opinions only. And if at any time they learned anything from Nature, they destroyed it again with their own Phantasies, Dreams, or Inventions, before they came to the end thereof; so that by them and their Followers there is nothing perfect at all to be found. This therefore hath moved and induced us hereunto, to write a peculiar book of Alchemy, founded not upon men, but upon Nature itself, and upon those Vertues and Powers, which GOD with his own Finger hath impressed in Metals. Of this impression Mercurius Trismegistus was an Imitator, who is not underservedly called the Father of all Wise-men, and of all those that followed his ART with love, and with earnest desire, and that man demon strateth and teaches that God alone is the only author, cause and Original of all creatures in this ART. Secondly, by what means a man may worke and bring the like power and strength of Metals to effect. And Thirdly, what Tinctures are to be produced from the Sun and Moone. Paracelsys of the supreme mysteries of nature: Of the spirits of the planets. of occult philosophy. The magical, sympathetical, and antipathetical cure of wounds and diseases. The mysteries of the twelve signs of the zodiack. Dry water from the Philosophers Clouds! Look for it, and be sure to have it, for it is the key to inaccessibles, and those locks that otherwise would keep thee out. Chorus Omnium: It is a middle nature between fixt, and not fixt, and partakes of a Sulphur Azurine. It is a Raw, Cooling, Feminine fire, and expects its Impregnation from a Masculine, Solar Sulphur. Our Stone in the beginning is called water; when the body is dissolved Air, or Wind; when it tends to consolidation, then it is named Earth, and when it is perfected and fixed it is called Fire. If in all orderly Speeches and matters of Learning it first of all behoveth to agree upon the Thing in hand, what it is, and what is the Reason and Bounds [or definition] of the same: It seemeth very needful in this Discourse of the Way to Bliss, to show first what is Bliss, because it is a thing much in doubt, and in question among the Learned. René Descartes 1596-1650 How can I find bliss? Jean Jacques Rousseau came up with a method by which he could come to an understanding with himself about G0d in his book Emile published in 1762. John Churton Collins was a literary critic who lived from 1848-1908. In 1904 he became professor of English literature at Birmingham University (United Kingdom). His posthumous essays were published in 1912. I liked the three below that I read into Librivox and converted to video. Michel de Montaigne 1533-1592 had definite ideas about Christianity as did Robert Browning 1812-1889. Robert Browning and Bishop Butler on Christianity 1752. Churton compares the writings of Bishop Joseph Butler 1692-1752 with those of Robert Browning 1812-1889 regarding the Christian religion. Gotthold Ephriam Lessing was born in 1729 at Kamenz in the Electorate of Saxony. The son of an orthodox Lutheran pastor and studied theology at Leipzig University. In 1769 he became librarian at Wolfenbuttel. Lessing decided to publish a book written by Hermann Samuel Reimarus 1694-1768 questioning the death and resurrection of Christ. Churton described the circumstances in the essay below. Georg Wilhelm Friedrich Hegel (1770-1831) wanted to find out “how” God taught the nations to become Christendom. Kierkegaard wanted to find out “how” he, as a single individual, can become an individual and stand before God in accountability. Kierkegaard used a pseudonym to ask this question. Johannes Climacus was the hero of the first part of his authorship (1843-1846). Climacus was someone like Johann Goethe or Friedrich Hegel who wanted to create a system that would make the question: “How do I become a Christian?” obsolete. Goethe searched for God in his own artistic way. He discussed his venture into this thing called Christianity in his book, The Autobiography of Johann Wolfgang von Goethe (1749-1832). Hegel wanted to explain Christianity Scientifically and create a universal ethic. If a method could be acceptable to all single individuals wars would come to an end and society would progress toward the Christian ideal of making everyone mature in Christ. Goethe thought people learn best through poetry and the arts but Hegel thought people learn best by trying to follow an ethical standard. 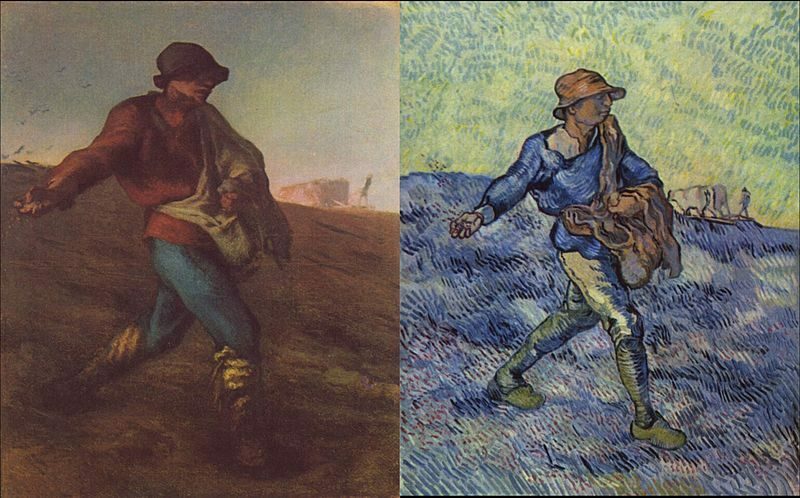 Kierkegaard studied the books written by both these authors and wrote his own critique of them in his writings. He came out against systematic Christianity because the single individual doesn’t need an authoritative system but what the single individual does need is a relationship with God using the way, life, and truth of Christ as the example He started out with the idea of God in his first writings because God came first and then Christ came in “the fullness of time”. This is a video of the seventh book of Goethe’s Autobiography. He explains the spirit of the age in the 1750’s and 1760’s. Here is Goethe’s Autobiography. It’s a long read but it can also be listened to. We are all readers and listeners and hearers and seekers. Goethe was a seeker. Christ’s disciples were with Christ in person and found it difficult to follow him at that time. Each single individual has the same problem they had. Here’s a video about Kierkegaard’s point of view. These are links to some of the books he wrote. Just as one would read the Bible to find out about Christianity one should also read Kierkegaard’s books to find out about him. David F. Swenson translated many of Kierkegaard’s books in the 1930’s and 1940’s and advised readers to begin with Philosophical Fragments. I like working my way through Kierkegaards Discourses. He wrote 80 of them in all. These are the books Kierkegaard published with his own money and his own advertising. He basically left the results of his work up to God. He left wondering if anyone would read what he had written. 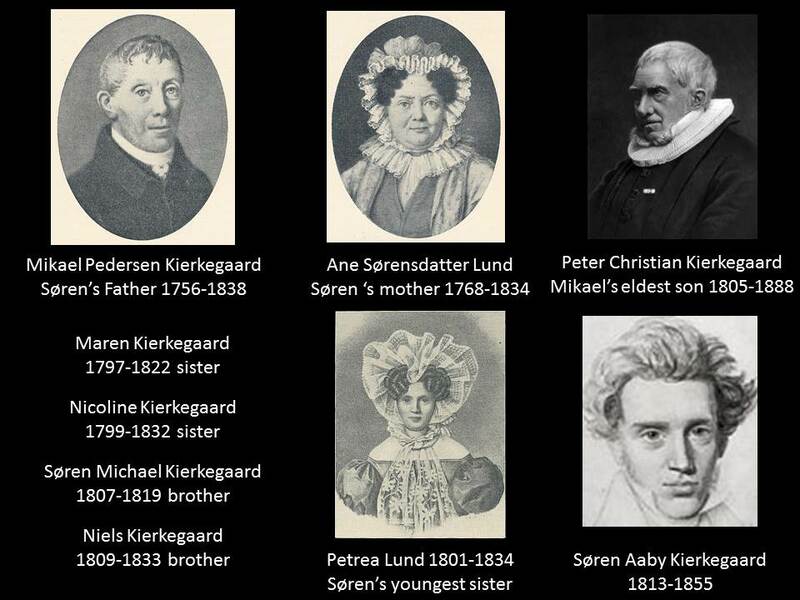 This is a picture of Soren Kierkegaard and his family. He lived from 1813-1855 and never married. Have you had a chance to read Stephen Blackhouse’s biography of Kierkegaard? I was very moved by the story of Kierkegaard’s breakup with Regina. I bought it from Audible. Regina was a big part of Kierkegaard’s life. Kierkegaard’s question: how do I become a Christian? Is a seemingly simple question that radically reframed the individuals entire relationship to Christ and Christianity.